Hair dryer available (220 V). 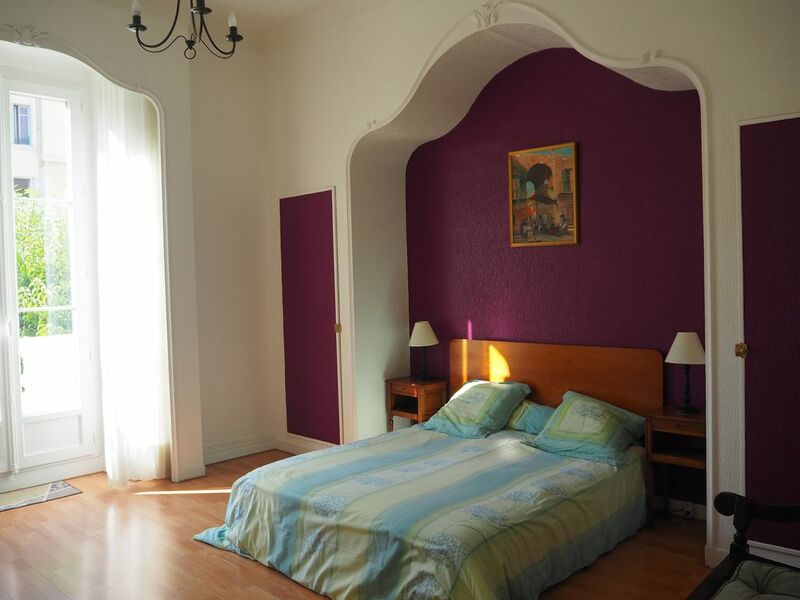 Large apartment, 5 minute walk to the main train station and to the tram, and a 12 minute walk to the beach. Couldn't ask for a better location. The apartment is located one floor up in an historic building (Villa Marie Josephine), and includes an off-street parking space, although the car needs to be very small to fit in the available space. There is a nearby supermarket (Monoprix) where you can buy almost anything. We loved Nice and the surrounding areas. We were blown away by Eze Village and St. Paul de Vence (traveled by bus).. Visited Cannes, Antibes and Monaco by train. And, we took a long train ride to Cinque Terre (5 Lands) in Italy to hike; highly recommended. Spent 3 nights there. Our month long vacation (November 2018) was action packed, so much to see and do. It was not beach weather, but perfect for walking. Used the Rick Steves' Travel Guide to make sure that we didn't miss anything. The apartment is not high end, in terms of furnishings, and we had trouble with the heating (hard to regulate) and the toilet is in a tiny closet, but overall the apartment was near perfect for our needs. A great value, and the landlord (Philippe) and property manager (Sandrine) were easy to work with. Highly recommended. I give it 4.5 stars. Thanks for your review! we have to add for new customers that we do not offer the small parking place anymore from 2019, as cars are growing and SUV trend is not made for it... But it is not really necessary to have a car in Nice, as you described it! With train or bus a lot of thinks can be done, Cannes, Monaco, Antibes, eze, saint Paul de Vence, etc... electric cars sharing service is also provided from the municipality. The french gas heating is sometimes not easy to be used by foreigners, we now. But it was changed in 2016 and full function. we should try to explain better the functionality on welcome app. We enjoyed to have you as long duration customer: 1 month is a good time to discover Nice and around, especially as we offer a special offer for long stay. Ruim en aangenaam appartement in bijzondere wijk. Een zeer ruim, aangenaam en van alle gemakken voorzien appartement in bijzondere wijk. Aangenaam balkon waar de hele dag zon is. Alleen jammer dat gemakkelijke zonnestoelen ontbreken. Het appartement is goed beveiligd, vanaf de straat toegankelijk via een fors hek. Dat geeft allemaal een goed gevoel want je zit midden in de wijk van de Noord-Afrikanen. Erg kleurrijk, dat wel. Het agentschap is behulpzaam. Dichtbij het centrum gelegen, alles is goed beloopbaar. Openbaar vervoer is hier perfect geregeld. Vielen Dank, gute Beschreibung ist uns wichtig, schön dass Sie Ihr Aufenthalt genießen könnten . Venons de passer trois excellentes semaines dans ce magnifique appartement, très spacieux, très bien situé au coeur de Nice, avec toutes les commodités. Idéal pour découvrir Nice et ses environs, la gare est à cinq minutes et le tram également. Les nombreuses lignes de bus sont à portée de main. Il y a certes un emplacement-voiture à l'intérieur de la propriété pour se garer, mais vraiment pas nécessaire. Y reviendrons volontiers! Je ne peux que recommander cette location au coeur du quartier marocain: pour ceux qui aiment les fruits & légumes frais, ne pas hésitez! merci de votre commentaire. Nice est en effet ideal pour passer quelques semaines en hiver! Nous offrons pour cela un tarif longue durée pour un sejour de plus de 4 semaines en basse saison. Le temps y est clément, certes quelques pluies mais aussi son lot de journées très ensoleillées ! sans oublier le carnaval de Nice chaque année en Février ! Die Wohnung ist sehr großzügig und schön eingerichtet. Wir haben uns sehr wohlgefühlt. Der Kontakt und die Organisation mit Vermieter und Agentur war sehr gut und sehr freundlich und zuvorkommend. Ich kann das Appartement sehr empfehlen. Vielen Dank, mit nun in 2017/2018 direkt Flug von hamburg nach Nizza auch im winter, ist es auch nicht mehr soweit die Sonne zu sehen! Die Agentur organisiert die Schlüsselübergabe und Endreinigung, sowie Bettbezüge im Preis alles inklusive! Das Rest mache ich als Vermieter immer freundlich! Nice is situated at the Mediterranean sea and is the capital of the Côte d'Azur (Riviera). Nice is well known for its pleasant climate in the period of March until the end of October. Nice also is a sunny, cosmopolitan town in the south of France with a lot of cultural facilities (opera, museums, classical to modern art, carnaval in February, Nikkaia-musikhall, jazz-festival in July, Triathlon in September etc.) Also visit the old town or all the typical provencial markets. Nice is closed to Cannes and Monaco (15-20 min with modern Train transport) Nice was the last years in complete renovation. Discover a brand new Town. Golf: You can find a golf area in Nice (3 km from the apartment 9 holes). and also in the near surrounding the best Golf (Cannes, Monaco, Valbonne, Mougins etc.). You need the car to reach it. WICHTIG: 1 Satz/ Person BETTWÄSCHE UND HANDTÜCHER INKLUSIVE!! GUT AUCH ZU WISSEN, im Preis ist auch ein extra Service beinhaltet: Die Betten sind VOR Ihrer ANREISE immer von unseren Putz Feen BEZOGEN. weniger Stress für euch!!!! Nur bei Langzeitmiete sind KEINE Bettwäsche und Handtücher inklusiv (siehe Details nachstehend) Wenn Sie ein Langzeitmieter sind (ab 4 Wochen Aufenthalt mit rabattiertem Monatstarif - Tarif außer Juni, Juli und August online erhältlich-), können Sie entweder ihre eigenen Bettwäsche mitnehmen oder extra Bettwäsche und Handtücher bei uns bestellen: 20 € per Einzelbett Set, 40 € per Doppelbett Set (1 Set= Bettwäschen, 1x Handtuch, 1x Badetuch + Kuchentuch) Für Aufenthalt die kurzer al 7 Tage sind (mindestens 4 Nächte ausser Hochsaison - siehe Mietpreis Kalender), sind die Preise pro Nacht höher, es wird einen ca. 10-15% Zuschlag gerechnet). Josephine bleibt immer einer sehr gute Preis-Leistung Angebot in Nizza Côte d'Azur: eine große Wohnung mit viel platz! Unser Service hat auch mehrere Kunden überzeugt. Bei Anreise am Sonntag oder Feiertag, behalten wir uns vor, 20 € mehr fuer die Organisation der Schlüsselübergabe zu berechnen. Anzahlung bei Buchungsdatum mit mehr als 35 Tage vor der Anreise (siehe online Zahlungsdetails) Mit Zugang der Buchungsbestätigung mit Anreise in weniger als 35 Tage nach Buchung ist die Bezahlung des Gesamtpreises fällig.